The Palestinian Authority would not oppose the prosecution of Hamas militants on war crimes charges at the International Criminal Court, Israel Radio on Saturday quoted the PA’s ambassador to the United Nations in Geneva as saying. Ibrahim Khraishi reportedly made the comments after the UN Human Rights Council’s voted in favor of his motion to endorse a report accusing both Israel and Hamas of committing war crimes during the December-January hostilities in Gaza. Speaking in an interview with Israel Radio, Khraishi said he had no problem in saying that legal proceedings against Israel over alleged human rights abuses should also be instigated against Palestinians. But he was quoted as adding that occupiers must not be confused with the occupied. It’s not surprising that the PA would like to see Hamas suffer! But what I’m interested in is the phrase I boldfaced at the end. It represents a ‘postcolonialist’ ideology, traceable to Frantz Fanon and Edward Said, that enshrines a double standard for behavior as applied, for example, to Israel and the Palestinians. Postcolonial theory asserts that there are ‘settler countries’ and ‘non-settler countries’, and of course you can imagine who are supposed to be the good guys. A great deal of effort is expended by the Arabs and their supporters to place Israel in the first group, with the Zionists in the position of colonizers of the ‘indigenous’ Palestinian Arabs. Honest historical analysis shows that in fact this is not accurate, but it’s important for them to say this in order to take advantage of the special dispensations granted to the ‘colonized’. Haaretz reported that a Palestinian woman blinded an Israeli soldier in one eye when she threw acid in his face. “The terrorist was arrested by security forces,” the paper said. An occupied citizen attacks an occupying soldier, and she is the terrorist? The argument depends on the “overwhelming odds”, the disparity in power between the ‘colonizer and colonized’. Edward Said, the high priest of applying postcolonial theory to Israel and the Palestinians, never tired of mentioning that Israel was a “nuclear power”, as if this had some relevance to its responses to Arab terrorism! Once it is established that one party is a ‘colonizer’ and the other ‘colonized’, the game is over. For the postcolonialist, nothing that the colonizer does to defend himself is permissible, and anything that the colonized does in the name of resistance is justified. This is insisted upon despite the actual power relationship between the sides, which — because of the actions and constraints of outside powers and the force-multiplying effect of asymmetric warfare — may be much closer to equal than the postcolonialist wants us to think. The postcolonialist point of view is endemic to the academic world — google ‘postcolonialism’ and you will be overwhelmed by the huge mass of professorial careers that have been built on it — but it has little applicability to the Israeli-Palestinian conflict, despite Said’s struggle to make it appear so. Like most grand theories — those of Marx or Freud, for example — postcolonialism gets its explanatory power when an apparently chaotic situation can be shown to be a special case of some general principles. Most such theories are inspired by a particular paradigm case; for Fanon it was the French in Martinique. Said, who was comparatively an intellectual lightweight, saw the huge power of the postcolonial metaphor to promote his own — Palestinian — cause. But it’s difficult to beat this conflict into the mold. First, the history of the development of the Arab and Jewish populations in Ottoman and Mandatal Palestine during the 19th century and the beginning of the 20th is much more a story of parallel development than of invasion and conquest. Although there were more Arabs than Jews in Palestine when the early Zionists arrived in the 1880’s, many of those Arabs were relative newcomers to the region themselves, originating in Egypt and arriving with the Muhammad Ali expedition to ‘Syria’ (which included much of what was to become the Palestine Mandate area) in 1831. Palestinian Arab nationalism and Zionism — and Arab and Jewish populations — both grew together until 1948, when the Zionists succeeded in establishing their state. The fact that many Arabs became refugees of the war was due almost entirely to bad choices made by their leadership — particularly the Nazi-allied Mufti, Haj Amin al-Husseini. And the fact that they stayed refugees after the war was a result of the intransigence of the Arab nations, particularly Egypt, which found their stateless condition useful. Second, there’s no colonial power whose colonists settled in Palestine. ‘International Jewry’, a convenient whipping boy, was always — and still is — sharply divided on the subject of Zionism. It’s more correct to see Zionism as primarily an indigenous — there’s that word — movement; in fact, Zionists among Palestinian Jews often had (and still have) serious disagreements with Diaspora Zionists. And third, as I suggested before, there is not such a great disparity of power between Israel and the forces arrayed against it, which include the Arab nations and an increasingly powerful Iran. Israel’s support from the rest of the world, which now seems to come from only the US and nations like Kiribati, is more tenuous than it has been in a long time. The colonizer-colonized metaphor clearly does not apply to Israel and the Palestinian Arabs. Even if it did, isn’t there something repugnant to the argument that absolutely any violent behavior — like throwing acid in the face of a conscript who was doubtless performing a police function, or blowing up a civilian bus, or breaking into a house and murdering its occupants, men, women and children — is justified in the name of ‘liberating an oppressed people’? Especially if the aim of such such ‘liberation’ is, as often happens, the establishment of an even more oppressive and/or incompetent regime, like that in Zimbabwe? The other side of the coin is that for the postcolonialist, the ‘settler country’ isn’t allowed to defend itself. Because of the great disparity of power that the ‘settler’ has by definition, anything that it does is ‘disproportionate’. The only moral option for ‘settlers’ is to flee or lay down and die. Sound familiar? This is what lies behind the Goldstone report and the multitude of NGO slanders that led up to it. Because the people behind them are steeped in postcolonialist ideology, they don’t have to prove that Israel committed war crimes. They know a priori that Israel is guilty, because it is a ‘settler country’, an ‘occupier’. 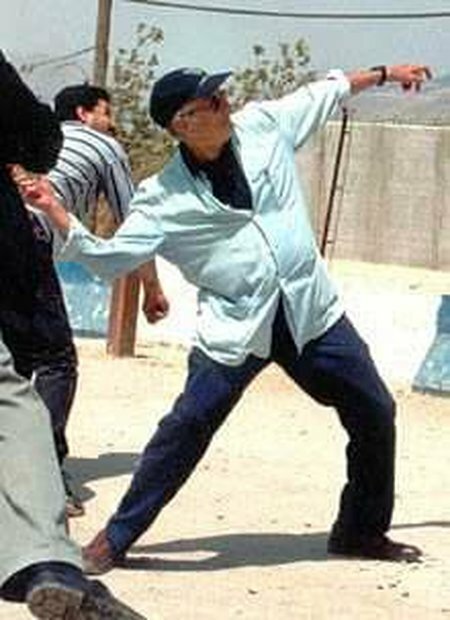 Postcolonial theorist Edward Said throws a stone at Israeli soldiers across Lebanese border in 2000. He missed. This entry was posted on Saturday, October 17th, 2009 at 9:04 pm and is filed under General. You can follow any responses to this entry through the RSS 2.0 feed. Both comments and pings are currently closed. The crux of the matter is the notion of Israel being an “occupier”. And the reason this blatant lie has persisted is because Israel never availed itself of its legal rights under international law. Only when Israel, the Diaspora Jews and the media will start talking about the seminal events post-WWI which shaped the whole modern Middle East, this nonsense of “occupation” will vanish. As Churchill said, Israel is in Palestine “by right and not by sufferance.” The San Remo Resolution (1920), the Mandate for Palestine (1922) and the UN Charter (Art. 80) attest to that. It is time someone shatters the illusion of “occupation” that Arab leaders have nurtured for so long among the Palestinian Arabs, and have succeeded in persuading the gullible international media. You will find some real perspective on these propaganda-driven pro-Palestinian movements around the world right here. You may want to use this in one of your posts, Vic. I believe the author is an atheist so it’s not like there is any religious agenda.